As well as our regular services, we enable our community to celebrate and thank God at the milestones of the journey through life. Through baptism we thank God for the gift of life, in marriage public vows are exchanged with God’s blessing and through funeral services friends and family express their grief and give thanks for the life that is now complete in this world and to commend the person into God’s keeping. Christening or baptism is a joyful event when a baby, young person or adult is received as a member of the world-wide Church. The service is arranged on request and the person to be Christened and also the family are encouraged to visit the church beforehand, perhaps at one of the Sunday services, such as Family Worship at 10.00 am on any Sunday. Christenings are normally held on a Sunday in the early afternoon. Our Priest likes to meet you and your family to explain what is involved and arrange the date and time of the service. 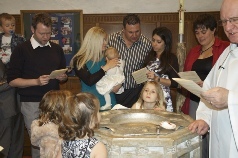 There is no charge for a christening however an offering is commonly made after the service. When a baby is born parents often want to thank God for their new addition to the family. A service of thanksgiving offers this opportunity and can form part of a Sunday service. This is not a christening so there is no need to choose godparents and no need to make public promises to God which you may feel you are not ready to make. 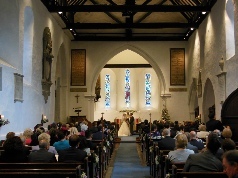 St Martin’s is a beautiful ancient church and a popular venue for weddings. Please make initial enquiries well in advance by contacting our Priest who will be delighted to speak with you and arrange to meet you. A Service of Blessing following a civil wedding or on the occasion of a wedding anniversary or other special event can be arranged. Please contact our Priest who can arrange to visit you and talk about your loss of a loved one. Advice can be given about what to do, in what is often a sad and painful time for you, family and friends. We will try to meet your wishes which may include a church service. There are regulations governing who may be buried in a churchyard. Memorials placed in a churchyard are carefully regulated by the Diocese. Details may be found in The Churchyard Regulations. The Rector is required to give authorisation before any memorials are placed in the churchyard.